The song set streaming and sales records for 2017 and broke the weekly streaming record for a song by a woman artist. Taylor Swift's "Look What You Made Me Do" has landed the No. 1 spot on the Billboard Hot 100, the site reports. The song broke weekly streaming and sales records for the year and recorded the most weekly streams for a single by a woman artist of all time. The debuted at No. 77, but jumped to No. 1 after its first full week of data tracking, bumping off Luis Fonsi and Daddy Yankee's "Despacito," out of the top spot on the chart. Swift's "Look What You Made Me Do" recorded 84.4 million US streams in the week ending August 31. The total streams for the single surpasses the previous high for the year, set by "Despacito" with 69.6 million in June. The song also passes up Adele's "Hello," which recorded 61.6 million streams in a week in 2015, for most weekly streams for a single by a woman artist. The track tops the Digital Song Sales chart with 353,000 downloads, topping Ed Sheeran's "Shape Of You," which was downloaded 240,000 times in its January debut week. "Look What You Made Me Do" marks Swift's fifth No. 1 single on the Hot 100. 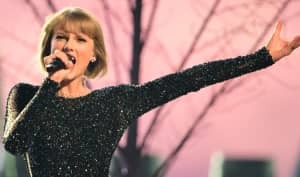 "Look What You Made Me Do" is the first single from Swift's upcoming Reputation album, due out November 10.